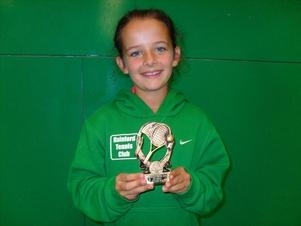 Maisie Lavelle from Rainford Tennis Club has won the 8 & Under Girls Singles at this week’s CCF Wigan Tennis Open. The eight year old won all her matches at the competition which took place at Robin Park Sports & Tennis Centre, including victory over Wigan’s Hannah Cunningham in the final. Winning the CCF Wigan Tennis Open was Maisie’s third win at this level in 2011, having already won the City of Liverpool Tournament and the North of England Championships. “Maisie should be very proud of her achievements this week” said her coach, Dave Hillier.